Over the 24 hours leading up to Remembrance Day services in London, a group of fitness buffs will endure a series of grueling workouts to raise money for veterans and first responders battling post traumatic stress disorder (PTSD). Dubbed 24 Hours of Heroes, the event begins on November 10 at 11 a.m. at MVMT Strength at 206 Piccadilly St. and continues until November 11 at 11 a.m. The CrossFit-style workout marathon raises money for Wounded Warriors of Canada, a charity that aids veterans and first responders suffering from mental health issues. The event was first launched in 2016 by Gord Hicks, a 7 year veteran of the Canadian Armed Forces and Bob Van Houwelingen, a critical care flight paramedic. 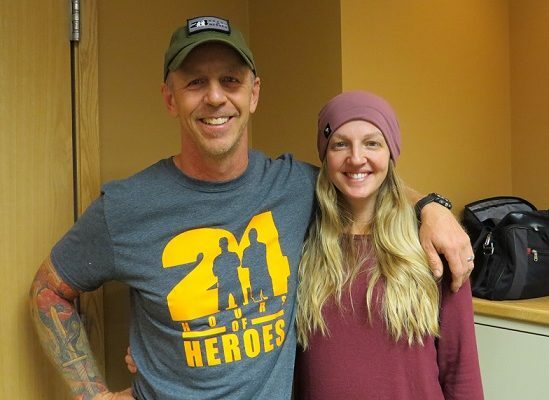 Last year’s 24 Hours of Heroes raised $10,000. That money was used to buy a service dog for a veteran dealing with PTSD. The group has set the same $10,000 goal this year and is very close to reaching it, said Hicks. There are 18 different workout routines planned throughout the 24 hours, each named after a fallen Canadian service member. Among the workout routines is one named for Captain Nichola Goddard, the first female combat solider to be killed in Afghanistan in 2006 and another for Corporal Nathan Cirillo, who was shot and killed while standing guard over the Tomb of the Unknown Soldier on Parliament Hill in 2014. A six-hour ruck march – a walk with a weighted pack – will also be held as part of the event. It will take participants throughout the city starting at 12 a.m. Sunday. For more information or to donate to the 24 Hours of Heroes click here.